Back-to-back hurricanes Harvey and Irma were unprecedented in their impact, destroying lives and homes, wreaking billions in damage, and knocking other news out of the headlines (a minor challenge for the media and public relations professions.) But the storms of September also brought some good news. Experts tell us that the U.S. is improving in how we prepare for and respond to hurricanes, for one thing. An A1 story in The New York Times cites better “weather forecasting, evacuation policies and hurricane-resistant building practices” as factors in the relatively low numbers of deaths and injuries in Houston and Southern Florida. And like any disaster, the hurricanes created heroes, from first responders to small businesses. Here are some of the reputation “winners” born amid the chaos of the storms. Houston furniture impresario Jim “Mattress Mack” McIngvale scored early PR points by opening two of his showrooms to shelter people who were displaced by Hurricane Harvey. He seized national attention with a Facebook video inviting all who could safely make it to one of his Gallery Furniture stores to come and even bring their pets. McIngvale has navigated these waters before; he offered shelter to victims of Hurricane Katrina in 2005. Clearly he’s a local businessman with a flair for PR and promotion, as well as a deep commitment to community. McIngvale’s bold gesture came in contrast to the response of Lakewood Church pastor Joel Osteen. Osteen was harshly criticized for not opening his 52,000-seat megachurch to flood victims until Monday, after a weekend of bad press and shifting explanations. He could learn a thing or two from Mattress Mack. Airlines are typically victims of a weather disaster, or occasionally, villains who are forced to make things worse by canceling flights. As Irma bore down on southern Florida, United was criticized for fares on flights out of the state that cost as much as $1000. But many carriers made news by capping fares instead. Those were led by JetBlue, who offered seats out of South Florida for a gentle $99 and waived fees for passengers having to change flights because of the storm. JetBlue’s move was followed by a response from Delta, which announced it wouldn’t charge more than $399 for tickets on flights to and from southern Florida and the Caribbean, including first-class seats. Of course, tickets were scarce by the time these announcements were made, but a few airlines did earn some reputation cred for their efforts. The hurricanes were both an enormous test and a branding opportunity for the ARC, which has weathered some PR challenges due to questions about what percentage of donations flows to helping disaster victims. Bolstered by third parties – from former president Barack Obama to Beyoncé, the organization met both the logistical trial and the PR challenge head-on with transparency about how donations are used in major media interviews by CEO Gail McGovern. For an excellent take on the importance of local disaster communications, check out this column by Houston PR professional Jennifer Evans. 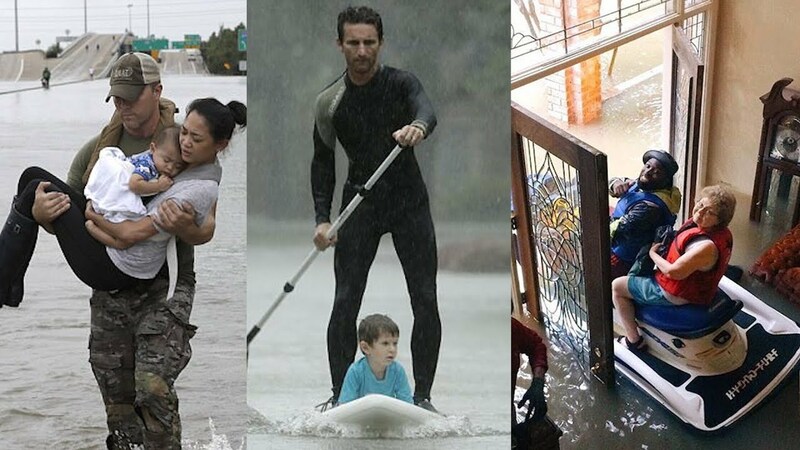 Most poignant and powerful of all might have been the stories of everyday heroes like the human chain of Houston apartment residents who helped a woman in labor make it through rising flood waters to be driven to a hospital. There were countless stories about regular people who went out of their way or even placed themselves at risk to help a neighbor.